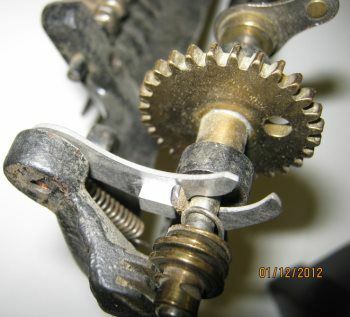 Our dynamite machinist can now make replacement shifter tabs for Gem Roller organs. These were used on other models of roller or cob organs. The most common broken part I have seen in my shop has been the shifter lever that pops the cob out of place to jump from the end of the song to the beginning as the song should repeat endlessly until you change cobs or stop cranking. We have now had these parts custom made. I am happy to offer a part that has likely not been offered for at least 100 years. Left is the original. Right is the copy. 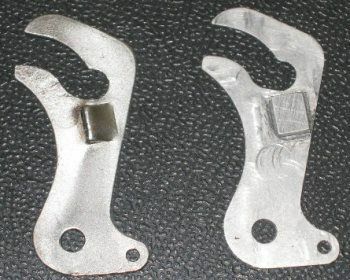 The original has a cut in the shape of a U with the center tab bent out while the copy has a block of metal spot welded in place. 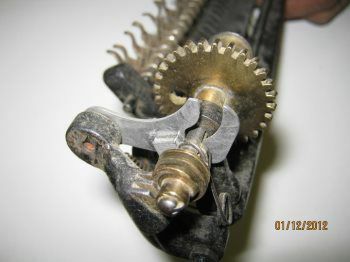 This tab/block flips the cob carriage and worm gear out of positon to let the spring push the cob back to the beginning of the song. I only have 6 available from the run I had made. I had several organs needing one. One of these organs had never played since restoration and that was all it needed to play again. 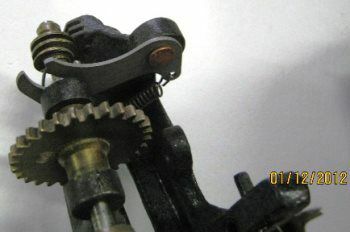 Below are some shots of the action with this part in place. I will have some other parts for these instruments being made so stay tuned. If you need one of these, get it now. I don't know if I will have reason to make more.